The following article, written by Ian Gleadall, describes the events surrounding and talks given at the Giant Pacific Octopus Symposium held at the Seattle Aquarium in Seattle, WA, USA in March of 2014. On the 29th of March 2014, the Seattle Aquarium was the venue once more for another (the second) symposium & workshop on the giant Pacific octopus (GPO). Organized and convened by Roland Anderson & Shawn Larson, it was overshadowed by the sudden but peaceful death of Roland on 19th February (see obituaries here and here, and message board). The symposium was therefore naturally dedicated to him, with most of the presenters overtly acknowledging the positive role that Roland had on their lives and their science. As last time, it was a very interesting event, but also a little subdued in view of the shock of Roland’s passing. Also as last time starting nice and early with a half-hour ice-breaker of good Seattle coffee & muffins, the formal proceedings kicked off on the dot of 8:30. The opening presentation was an emotional introduction from Shawn Larson, Bob Davidson & C.J. Casson, including a number of photo shots of Roland as his typical self. Roland’s importance in getting this symposium going was conveyed clearly, not forgetting his financial lubrication in the form of paying the travel expenses of those attending as presenters. As last time, the talks were each very different but equally interesting, and all presenters did an excellent job of making themselves clear and intelligible to the wide range of attendees (the latter, in addition to many scientists, included a variety of aquarists and educators, both volunteer and paid, as well as people just with an interest in, but no research or educational background in, the life of octopuses). Everyone gave their full attention to all the talks, asked many thoughtful questions and clearly appreciated the efforts and work of the presenters. James Wood provided a general introduction to the diversity and lives of cephalopod molluscs, covering a remarkable variety of topics in just 30 minutes. This was aimed particularly at non-specialists to provide a grasp of the breadth of the cephalopod group, giving a taste of what we know about them but also noting some of the many things we know little about. It was a colourful and fascinating backdrop to the rest of the symposium. Also at a broader level, Jennifer Mather explained the progress of her work with Jean Alupay in developing an octopus ethogram (that is, an inventory of all behaviour patterns of an octopus). Although usually aimed at a particular species, Jennifer pointed out that data are still lacking and are incomplete for all species. In this presentation, Jennifer defined 6 discrete physical units of the octopus body (mantle-funnel, the arms, the suckers, skin and web, the head, and the mouthparts), 5 combinations of these units (each centred around one of the units, assisted by one or more of the others), and 5 actions (including crawling, egg-laying and exploring), which are complex and involve several combinations. The aim of this ethogram is to form a basis for describing octopus movement for further evaluation of the physical dynamics of actions, their neural control, and combination with the appearance of the skin. Shawn Larson explained her work on the population structure of GPOs in the northwestern Pacific. Using microsatellite markers, Shawn sampled 88 individuals to compare populations at one Canadian and three US localities on the NW Pacific coast (British Columbia, Oregon, Neah Bay & Puget Sound). There was good evidence for polyandry, in finding that a mean of 2 or 3 males had contributed to each egg mass. Generally, the results showed evidence for moderate population structuring, with no significant prior population bottleneck. The three localities off the US are the most closely related, with differences from the BC population considered to be due to the arrangement of local ocean currents and the intervening relatively deep Straits of Juan de Fuca which, it is thought, may preclude regular migrations. Shifting attention to populations further north, David Scheel discussed three aspects of the giant octopuses based on his observations of specimens sampled from early-summer tidal pool surveys on the coast of south-central Alaska. He has found, firstly, that the abundance of E. dofleini in Prince William Sound (PWS) during early summer fluctuated more than 6-fold over the 20 years of data acquired and is negatively correlated with mean sea surface temperatures of the previous 30 months off Haida, BC (downstream of the currents from PWS). Similar correlations were found in Puget Sound winter dive surveys and the conclusion is that coastal abundance is influenced during paralarval stages in the life history far from the site of recruitment to benthic habitats. From observation of midden contents, David also showed that E. dofleini seems to have a preference for larger crabs over small. Among species taken less frequently was Lophopanopeus bellus, growth of which is retarded by the presence of the rhizocephalan parasite Loxothylacus panopaei, and crabs adorned with bristles or other decorations. The adorned species also tended to stop moving in response to the presence of an octopus, while unadorned crabs try to actively escape, which probably makes them easier for octopuses to locate and capture. Lastly, there have been a number of recent reports of a clade of GPO that is different, at the molecular level, from the majority of GenBank GPO sequences. David Scheel and his group have demonstrated that differences extend also to physical appearance. Members of the new clade display a longitudinal lateral fringe (termed a “frill”) around the edge of the mantle (not present in the true GPO); a pair of frontal white spots (the GPO has just one); 3 “eyelash papillae” beneath the eyes (absent in the GPO); and no longitudinal mantle folds, especially beneath the lateral frill (the presence of such folds is characteristic of most other species of Enteroctopus). This clade appears to be distributed from southeastern Alaska (including a sighting near Juneau) to Zhemchung Canyon in the Bering Sea, although elucidating the exact distribution requires further data. With regard to the presence of more than one species of GPO in waters off the northwestern Pacific coast of North America, Ian Gleadall addressed the problem of naming the species involved. He provided a brief review of the available names, noting that 4 different genus names and 10 species names have been associated with North Pacific GPOs. The genus name is now well established as Enteroctopus, but appropriate species names for the different clades are unclear and require further research, which is in progress. Richard Hocking talked about his work at another aquarium that has a long tradition of exhibiting GPOs (since its opening in May, 1998): the Alaska Sea Life Center (ASLC) at Resurrection Bay in Seward. Richard provided interesting information about the details of maintaining GPOs in cooler climes: the octopuses are naturally abundant locally and can be easily captured in traps very close to the aquarium. The seawater supply is a continuous open flow, from water pumped up in pipes from 84 m (275 feet) deep, with an annual ambient temperature range of 3-10°C (water in the aquaria is typically 0.5-1.0°C warmer). Oxygen levels stay close to saturation levels all year round, salinity is stable at around 31 psu and ammonia, nitrite & nitrate remain negligible. Water flow is sufficient to maintain currents and upwelling to keep plankton and filter-feeding invertebrates constantly in motion. Feeding of ASLC GPOs is on alternate days, with food for the octopuses relying on donations from local commercial fisheries, particularly frozen crab, shrimp and clams, since ASLC is not permitted to collect live food from the wild. This is supplemented with fresh food from other aquarium specimens that are unable to complete a molt (crabs), raised in-house (spot shrimp, Pandalus platyceros) or are surplus fish culled from exhibits (salmon). Juvenile GPOs are fed on blue mussel, small bait fish (herring, smelt, silverside) and Antarctic krill. As they grow larger they are provided with crab claws, whole frozen shrimp, and then on to whole thawed Atlantic rock crabs (Cancer irroratus), Alaska sidestripe shrimp (Pandalopsis dispar), razor clams (Siliqua patula), squid (Doryteuthis opalescens) and the occasional surplus fresh coho salmon (Oncorhynchus kisutch). Herring and capelin have been tried but produce oily faeces from the octopuses, causing concerns over their long term health. Non-floating prey remains are scavenged by a variety of echinoderms included in the aquaria. Longevity of GPOs in this region may be a little longer than further south (possibly up to 6 years: those at ASLC have lived as long as 5 years from being captured when juvenile), and colder sea temperatures may be a factor. However, GPOs are not usually kept for their entire life span: maturing animals are routinely released into Resurrection Bay unless retained for mating. Guy Becken’s talk, entitled Cephalopods: Aliens to Friends, took a look at trying to explain the fascination of the sea and its inhabitants, especially cephalopods, considering their alien appearance (in comparison with humans, at least), with an emphasis on the growing popularity of diving to observe GPOs in Puget Sound. He also gave an account of dramatic events following removal of a giant octopus by a fisherman (validly licenced to harvest molluscs), the consequent outcry by the general public, and the subsequent enactment of regulations to restrict fishing in the Sound and to establish 7 protected areas for octopus and other marine life. Kathryn Kegel’s presentation followed up to explain the procedures that led to the setting up of the new protected areas, which were established by the Washington Department of Fish and Wildlife on 6th October, 2013. Addressing a different aspect of taking GPOs as food, Reid Brewer explained his work towards improving our knowledge of the effects of fisheries activities on GPOs. Because of the lack of fisheries data, attempts at fisheries management for GPOs have resulted in punitively small catch allowances, so as a contribution towards acquiring more data on resident GPO populations, Reid and colleagues have been using visual implant elastomer (VIE) tags in capture-recapture studies. The tags have been performing well (other tags are removed by the octopuses or quickly become obscure) and are now being used routinely to gather further data to enable more realistic catch allowances to be determined. To date, Reid has tagged and recaptured an impressive number of octopuses, and this VIE technique is providing key field data on aspects such as growth rates in the wild. Finally, Kirt Onthank set himself the task of reviewing the possible effects of hypercapnia (high CO2) driven ocean acidification on GPOs, along with hypoxia and ocean warming. He noted that there are massive changes ahead in the form of an estimated fall in the pH of the World Ocean by another 0.3 to 0.4 units by 2100 (reported to be the fastest pH decline in 300 My), along with a sea surface temperature rise of 1.5 to 2.9°C. 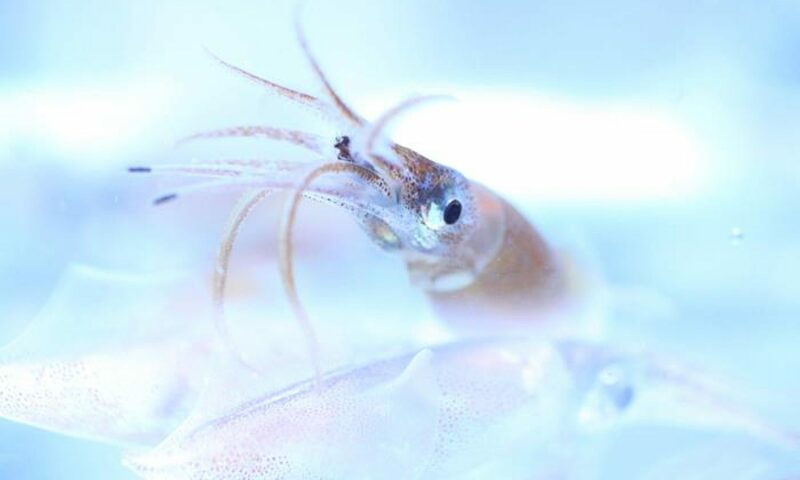 Kirt noted that the oxygen binding affinity of cephalopod haemocyanins shows a profound Bohr Effect, along with a Root Effect, both of which cause a decreased affinity for oxygen with the lowering of pH, exacerbated by rising temperatures. This suggests that the most highly active cephalopods in particular will be at risk through consequent physiological limitations arising from higher temperatures and lower pH: for example, acute environmental hypercapnia (elevated CO2) has been shown to cause severe metabolic depression in Dosidicus gigas. However, the effects of hypercapnia on cuttlebone growth are positive, suggesting that sepiids may have an advantage under such conditions. For many cephalopods, though, there are a slew of other effects of higher temperature and lower pH, particularly at embryonic stages, with longer hatching times; shorter mantle lengths for hatchlings; and alteration of trace mineral accumulation, affecting properties of squid egg membranes. Currently, no experiments have yet been reported where two or more of these adverse variables have been used in combination to challenge cephalopod responses, so the exact effects can only be estimated by hypothesis and extrapolation from other studies. Further, most experiments that have been done have used decabrachian model species, so the effects on octopuses are even less well understood and present an obvious gap in current knowledge of the effects of environmental change on cephalopods. Preliminary unpublished data by Kirt suggest that GPOs are apparently more tolerant of hypercapnia and hypoxia than other cephalopods, which is thought to be an advantage connected with their large size. The roundup discussion at this conference was very different from that of the 2012 conference, where Roland steered the proceedings through several different topics that he felt required further discussion, soliciting questions from the audience to a panel composed of the presenters, as well as he himself asking the panel a number of challenging questions. On the present occasion, the epilogue took the form of a general discussion about the future of the GPO conference itself, now that Roland is no longer at the helm. It was generally agreed by all that this series of conferences should continue in the future, with the next one taking place in 2016. We all look forward to seeing this popular and important event continuing as Roland would have wanted, as a forum between scientists, aquarists, educators and the general public to explain and discuss in layman’s terms the results of current research on the GPO, which is increasingly recognized as a group of species rather than just the one that has been assumed until recently. In view of the infancy of the fishery for GPOs, and the relatively poor state of our knowledge of these fascinating animals, this conference seems likely to gain in importance over the coming decades. We thank you, Roland, for starting the ball rolling and sincerely expect that the growth in importance of this conference will become a lasting tribute to you as its founder.